OpportuneJobs.com is about matching ability with opportunity. It is a one stop portal for Jobs, Fellowship, Internship, Volunteering, Consultancy, RFP/EOI/Tender, Events and News, OpportuneJobs.com acts as a bridge connecting individuals and NGOs/Social Enterprises. India has 3.3 million NGOs, with over 700 NGOs opening every day. Growth created demand- people with technical and managerial skills driven by goals beyond the profit motive. No. of HR agencies that provide candidates but employers struggle to find the right talent. A simple one-site-fits-all jobs approach unfeasible. 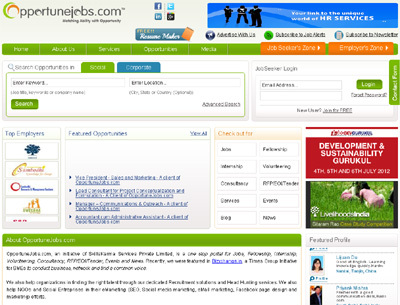 OpportuneJobs.com, in addition online posting of jobs, internship, volunteering, fellowships, consulting assignments, also offers headhunting services, letting employees post their resume, eMarketing, conducting awareness programmes and events for NGOs/Social Enterprises.